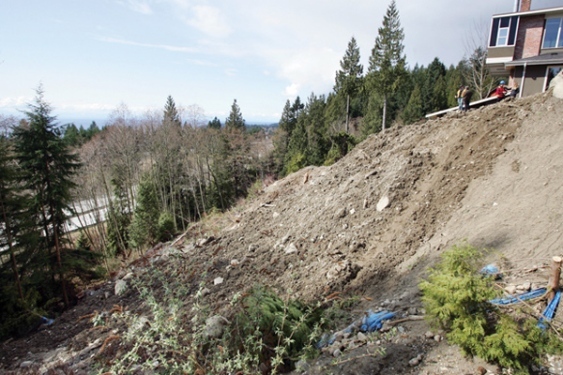 The District of West Vancouver will complete remediation work in the British Properties after illegal landscaping work triggered a landslide that damaged a tributary of fish-bearing Rodgers Creek. And the hefty bill which estimated to be between $100,000 and $150,000 - will be going to the owner of that home.Council resolved to undertake the work at 2785 Chelsea Close and bill the homeowner last week.The property had a significant landslide after the owner, in defiance of a district stop-work order, continued trucking in loads of fill to elevate one spot of his property.The district of West Van is not anticipating long-term environmental damage but local Streamkeepers are monitoring the creek closely.The district has hired an excavation company to remove tonnes of fill to stabilize the slope. Once that's done, it will have to be hydroseeded to increase the soil stability and to slow erosion. Despite failing to get a necessary permit, disobeying a stop-work order and failing to do the remediation work himself when asked, the district has reason to believe it will be able to collect the funds from the owner. "Under the community charter, we can collect those costs in the same way we would collect property taxes," said the district's director of communications. "However, I have it from our manager on site that he's already had conversations with the property owner about how he'll go about covering the costs of the remediation work. We don't anticipate any issues there." This page © Copyright 2014, North Shore News.